I’ve got heavy love for this quote from Ray Bradbury and I’ve been thinking about it a lot lately. So it made me wonder, what is it I’m stuffing myself full of? What is it I love? What inspires me, even if indirectly? For the next several weeks and quite possibly longer I plan to write about those things that I love, why I love them, and how they further my education in mastering storytelling and writing. And if you’re willing, I’d like to see you do the same. 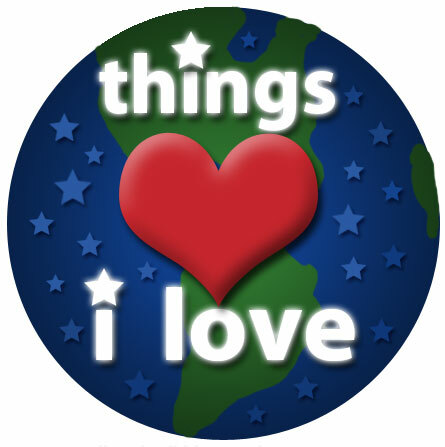 I’m going to tag posts about things I love with the hashtag #thingsilove on Twitter, or for you WordPress users, tag it “things i love” in your tags section. If you would like, you can pingback to this post so I can come read about the things you love and how they inspire you. What I’m hoping to gain from this post and hopefully your posts is not just insight into what we love and why, but perhaps new loves we’d never considered before. If you do write a things I love post that I find particularly inspiring, entertaining, or just plain wonderful, I’ll link to your post here and send some blog love your way. Feel free to use the things i love graphic in your post if you’re not the graphic creating type. I’ll start this off with something simple. I love finding out about new things to love. I remember awhile ago Daphne posted a picture of this astronomical clock in Prague. I’d never once before in my life heard of this clock and now I can’t imagine my life before it. My imagination swells at its very existence and I know someday it will part of one of my stories. Getting into blogging has enabled me to stuff myself full of new inspirations, as Mr. Bradbury suggests, unlike ever before. Yes I learn a lot about new things via Facebook, Twitter, etc. But it’s those carefully written posts I’ve read for the sake of seeing what’s happening that lead me to new discoveries. The blogosphere is beautiful fodder for imaginative minds. Tomorrow, I begin with something I love dearly and I’m sure many of you do too: Farscape. See you then! But before you go, I really, really do want to hear about those things you love. Will you commit to doing at least one blog post about something you love? I want to know why it inspires you. Why do you love it? I look forward to seeing your posts. Again, pingback here, tag it with WordPress or using the hashtag #thingsilove on Twitter. I hope to see your posts soon. Great idea. I’ll have to think about this one…. I think this will definitely prove an interesting topic. I hope at least a few of us jump on it. Learning about new things does really help inspire me. I just thought of what I’m going to write about. Things I Love: My First Book. I’m not going to tell you the title yet, but I’ve been thinking about this a bit recently and this will be the perfect topic. Thanks for the inspiration! Excellent. I look forward to it! I will definitely write a blog post on something I love – we can all use new ideas for posts, so thanks for writing about this. Right now though, off the top of my head, one thing I really loving is learning new stuff. Just like your coffin raciing, if I see that kind of headline somewhere I am off to search the internet for everything I can find out. I just wish my brain was big enough to retain everything I read . . .
I’ll definitely have to do a blog post about this. Thank you for the new idea, and I’ll look forward to your future posts on the subject. Maybe I’ll find something new I love, too. Jae, I’m on board. I’ll write one the first week of November. It will give me time to consider. Thanks for the challenge. Awesome! I’m looking forward to it! Great Idea! I did something similar last Christmas season on my blog, doing a 12-day / personalize 12 Days of Christmas rundown of the things in my life for which I was grateful & which I loved. (My kick-off post was an ode to my ancient farmhouse. It’s here: http://museinks.blogspot.com/2011/12/on-first-day-of-christmas-revamping.html, if you’re so inclined…) I found it put me in the right frame of mind for the holidays. Furthermore, I discovered later that my posts really touched readers in ways that my regular blogs didn’t. Much like the Astronomical Clock moves one in ways regular clocks don’t. There is so much that fills our lives with joy. Too often, I am guilty of overlooking those things and focusing, instead, on stuff I *don’t* love. Perhaps it’s time to revisit the theme of what moves me and what makes my life worth living and expand upon it. I think you should totally sponsor a 12 Days of Christmas blog posting again. I’d join up with you, I’m sure a lot of other people around here would too. You could start it Dec 12 so people don’t have to blog on Christmas if they’d rather not and do it 12 days from that date. If you do decide to do it, let me know, I could create a graphic for it and jump in. 😀 I may post this on your blog as well in case you don’t get notices from replies here. Something along those lines. And I just kept thinking about it, so it’s funny you’d ask if we’d do a post on things we love. I’m sure you can come up with something, and I fully expect to see a couple appear on your blog this month! Excellent. I’m always eager to learn what things inspire people. I love the idea of this and want to join in!